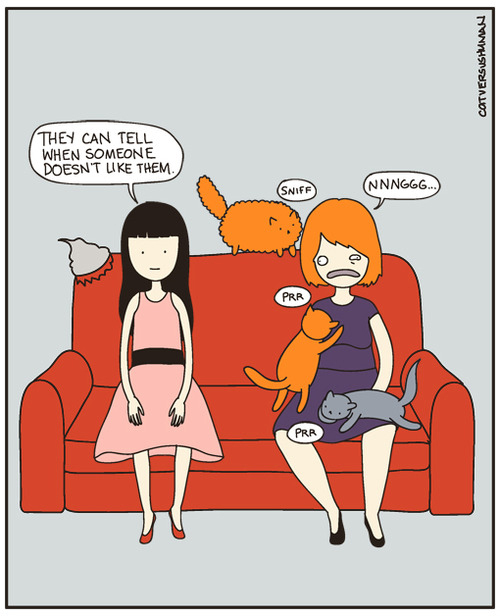 My cats are also drawn to people who are allergic to them. The more you hate the more they love. lol. My mom's friend HATED cats with a passion, and every time she came over, without fail, the cats would be ALLLLLL over her. Our family would laugh about it later, cuz we knew they did it on purpose. Kitties are the ultimate adorable trolls. I read that the body language of a human that doesn't like cats tells exactly the opposite to them. Like: A No-cat-lover doesn't look at the cat and that means "I like you" translated in cat-language. They definitely can! Although, the only people I know who "hate" cats have never even had them as pets, they just say that for whatever reason (I think it's the same thing that makes people who have never met a LGBT person say they don't like gays....). My mum hates cats, and they ALWAYS flock to her, especially strays. I love cats, and I'm always like "Kitty! I love you! ", and they just stare at me like I'm crazy. There was a study that showed that more neurotic a person, the less a cat will pay attention to them. That explains a lot about me. Paul Leyhausen was a German ethologist (animal behavior scientist) who spent most of his career studying the behavior of domestic and wild cats. Among the things he found was that, unlike in comic strips, cats do NOT like being stared at. As predators, they always attack from behind and having their gaze met means that the prey are aware of their presence. The cat looks away and gives the appearance of ignoring the prey animal. This is true of all cats, regardless of size, and Leyhausen recorded accounts of people in Africa fending off lions simply by staying in front of it and staring it down. In his landmark book Cat Behavior (German title Verhaltenstudieren an Katzen), Leyhausen observed that when a domestic cat enters a room full of people, cat lovers look at the cat while people who don't like cats (for whatever reason) look away. Since a stare is a threat, the cat naturally gravitates to the people who aren't looking at it. Leyhausen's book is available on Amazon, but it's out of print and used copies cost a fortune (I was lucky enough to buy a copy when it was new and relatively cheap). I recommend reading it, if you're lucky enough to find a copy in your local library. Ewwww, Yasmine! How could you possibly have someone in your home who doesn't love cats? Those are absolutely NOT WELCOME here! "Allergics" the same. Cats are only drawn to me when they want cuddles or food, hahaha. My cat LOOOVES people who are allergic. Hilarious! This is so true! It's funny, when I smother my cat with love and affection, they want nothing to do with me. When I am busy reading, doing something on the computer, sleeping or feeding my baby, they are all over me! Other than that I finally found Cat vs Human book! After almost a year I finally got my copy! really cute blog. thanks for the posts. You have no idea how true this is. I'm allergic to the cute little buggers and because I have to force my hand away from cuddling them, they love me... I once visited a woman with a big beautiful steel grey cat with green eyes. Jumped right onto the coffee table and stared intensely at me for minutes because I wasn't all over it.